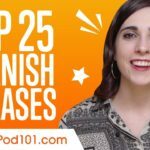 Home \ Learning \ Learn the Top 25 Must-Know Spanish Phrases! Get started learning Spanish the fastest, easiest and most fun way with Rosa! You’ve decided to learn Spanish, but where to start? You’ll need to start building up your vocabulary, and the most important of these are the Phrases. In this video, you’ll learn the 25 most important Phrases in the Spanish language. Let Rosa help you through this subject as you continue learning Spanish! If you liked this video, be sure to subscribe and check out Rosa’s Weekly Words series!